Thanks to better awareness and understanding of good oral hygiene, people aren’t losing their teeth as frequently these days. The National Institute of Dental and Craniofacial Research announced that the number of people with tooth loss (total or partial) has decreased dramatically since the 1970s, at least in the United States; and it’s safe to say that the same trend has occurred in successful, thriving nations like Singapore. Even though people don’t lose their teeth to neglect as often, tooth loss does still occur. Usually, it is the result of an accident or unexpected trauma. Once a tooth is knocked out or removed, it can be very expensive to replace. Find out how much artificial teeth or dental implants cost and how you can minimise the expense. Did you know that 178 million people are missing at least one of their teeth? If you have a missing tooth, you’re not alone, and you do have options. One option is to fill the space with a dental implant, an artificial tooth that looks just like your other natural teeth. About 2.3 million dental implants are made every year to replace missing teeth. Thanks to modern technology, dental implants have made huge strides during the past couple of decades. They are now made of stronger, tougher material, so they last longer and are more resistant to stains. Your dentist in Singapore can have your new artificial tooth custom-made to have the same shape and colour as your natural teeth, so the people who see your smile will never know the difference. The dental implant is a permanent tooth replacement, one that you can clean and care for just like the rest of your teeth. It is actually screwed into your jawbone, with the metal screw acting very much like the natural roots of your teeth. Your other option to replace a lost adult tooth is some kind of denture. Dentures can be taken in and out. They fit over your teeth during the day, and at night you take them out. Dentures are not as permanent, attractive, or convenient as a dental implant. However, they do cost less, which can be appealing to patients on a tight budget. If you replaced all your teeth with dentures, it might cost about $2,500 U.S. Just one dental implant for a single missing tooth is about $3,000. However, consider the fact that every few years, your dentures will need to be replaced. The price you pay for them is a recurring cost for the remainder of your lifetime. 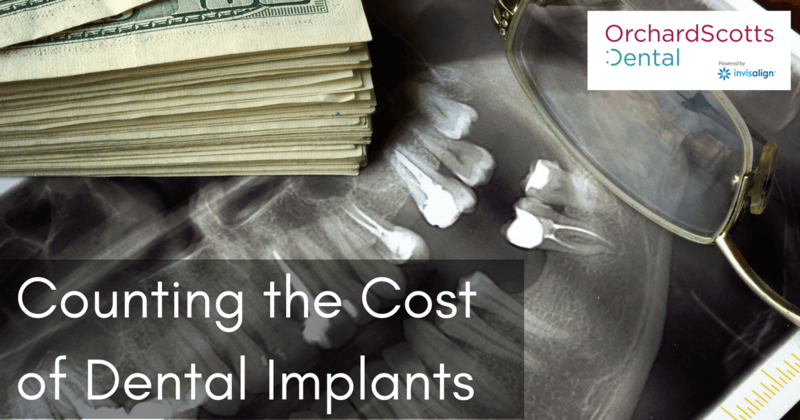 With dental implants, the cost is higher, but it’s a single, one-time thing. You could still have to replace them at some point, but with a success rate of 95 percent, it’s more likely that your dental implants in Singapore will last for decades. If you need dental implants, but you’re cringing at the cost, set up an appointment at Orchard Scotts Dental. As a trusted dental clinic in Singapore, we’re happy to discuss the cost with you and provide some payment options for your consideration. If insurance doesn’t cover any part of the implants, a payment plan, dental discount plan, medical financing, or some other arrangement may be an option. Plus, remember that filling the gaps in your smile could make a huge difference in your confidence, your professional life, and your personal future.